I created this mind web using Webspiration, an online mind mapping software, as an assignment for my Multimedia course. Webspiration is a web based version of Inspiration. It was a very user friendly tool, where your final product can be exported into several formats including Google Docs. 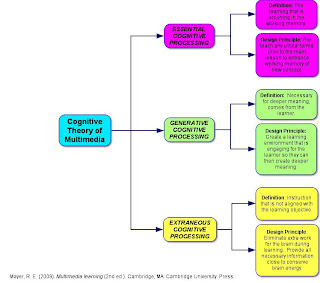 The debate between the two educational learning theories cognitivism and behaviorism educational learning theories is an age old discussion in the educational realm. The challenge of these two learning theories is that neither of them fit into the one size fits all model. Two blog posts debate the differences between these two theories. The blog posts include comments from three important thinkers of today: Kerr, Downes, and Kapp. Kapp supports both theories and prescribes to the idea that a melding of these two ideas creates a well-balanced learning environment. Through an in depth understanding of both of these schools of thought, an educator can develop an optimal learning environment. "People and animals may not learn in the same ways. People possess abilities unique to the species. Mental events are central to studying learning. The study of learning should be objective, and learning theories should be based on evidence. However, inferences can be drawn about the nature of internal mental events that produce observed responses. Individuals are actively involved in the learning process and control their own learning. Learning involves the formation of mental associations not necessarily reflected in overt behavior changes. Knowledge, beliefs, attitudes, and emotions are all associated and connected, that is, organized. Learning involves relating new information to previously learned information". Piaget, Vygotsky, and the Gestalt psychologists are all educational theorists who can be categorized as cognitivists. Behaviorism embodies the concept that people learn through the environment around them. The Encyclopedia of Educational and Leardership Administration characterizes behaviorism as "the result of environmental stimuli that “condition” behavior responses. Behaviorists assume that human beings and animals learn in the same way, so principles derived from research with animals are applied to human learning. Learning is studied by observing and measuring an organism's responses to environmental stimuli". Skinner, Pavlov, and Hull are three educational theorists who fit the behaviorists model. In our every diversifying society it is become more challenging to develop one idea and have it fit all situations. Learning environments is one such place where this phenomena proves challenging. In order to best reach our learners it is critical to be well read in a large variety of theorists and then be able to apply their theories in the appropriate setting. One size does not fit all, but there is the right t-shirt, or theory, out there for all situations. How Good Is Your Plumbing? Does learning take place inside a brick building with students sitting in neat lines of desk? Does learning take place by a stream bed classifying organisms? Does learning take place in a public library reading room? Does learning take place in the car on a trip across country? Does learning take place on a Internet website? The answer to all of these questions could be yes! Siemens (2004) stated "the pipe is more important than the content within the pipe". The pipe that he was referring to is a persons ability to learn, and the content of the pipe is knowledge. Siemens was predicting that future learning theory needs to take into account that with a rapidly changing world with exponentially growing amounts of knowledge, a person needs to know how to find the information that they need more often then have the information memorized. Shift Happens is a group that has been producing short videos on the rapidly changing world that we live in, and the career and educational challenges that our students face. From the Ebbinghaus, to Thorndike, to Pavlov, and Gestalt the way that humans learn how been theorized and hypothesized. The difficulty with these learning theorists is that they did not create their learning theories with the 21st century challenges in mind. Siemens (2004) even suggests that with the current technology trends the way that humans learn could be changing. In today's 21st century with schools quickly adapting a larger variety of educational technology it is critical to look towards the suggested skills listed for the 21st century. 21st Century Schools is a website that clearly outlines what these skills are, and the differences between today's traditional schools and those that encompass 21st century skills. People learn best once they have spent time learning in a variety of ways. Gardner, and other psychologists, have outlined in his multiple intelligences theory people all learning through their own unique combination of effective means. Once a person has spent time learning through a variety of styles they are able to determine which style is best for them. If a person is only exposed to a limited variety of ways to learn, then they may not have the chance to find their best learning style. Learning theory is critical to education. Through learning theory controlled scientific experiments have proven a variety of elements crucial to providing the best learning environment for learners. Learning theory and educational technology are important with the rapidly changing world that we need to prepare our students for. Through the 21st century skills and what we already know about learning theory from Gardner, Thorndike, Pavlov, and Gestalt we can create a learning environment where the needs of the students and their learning needs meet. In this environment both the students pipe and plumbing will be fostered. Part 1. Create a time line from 1900 to the present, and select three decades that fascinate you the most since 1950 for your analytical paper or podcast. Develop the time line using technology using time line software, a multimedia presentation, a word processing document, or another technological presentation of your time line. Color‐code or use some identifying element for each strand of the time line. Strand 5: Nature of society and culture: What key events determined the thinking of the decade? The planning templates organizing the information be strand can be downloaded by clicking on each of the above strands. Part 2. Once the time line is completed, write a paper or create a podcast explaining the interrelationships of the events selected for each of three decades. In many cases technology has an influence on other factions in society, and in return, they have an influence on the ways that technological innovations are developed. Select any three decades from 1950 to the present for the analysis.